On Monday, the US Treasury Department sanctioned three senior North Korean government officials over alleged human rights abuses. North Korea's Foreign Ministry said on Sunday that nuclear arms disarmament could be permanently stopped as a result of Washington's decision to impose sanctions that pressure the Asian state. The ministry noted that the US administration had introduced "sanctions measures for as many as eight times against the companies, individuals and ships of not only the DPRK but also Russia, China and other third countries…"
The statement comes after the US Treasury Department sanctioned three senior North Korean officials earlier in the week over alleged human rights abuses. The situation on the Korean Peninsula has improved since the beginning of this year, with North Korean leader Kim Jong-un engaging in a dialogue with the United States and South Korea. 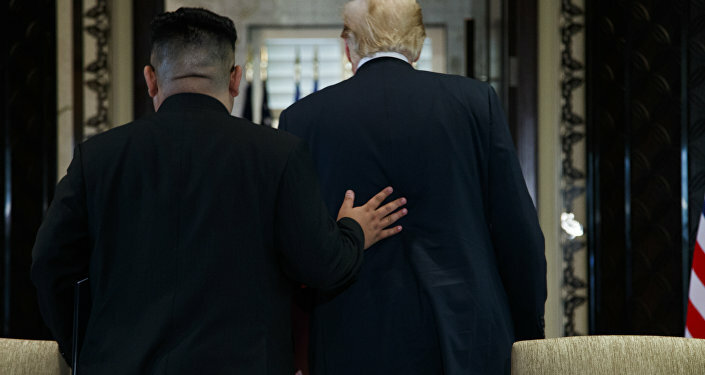 During their landmark summit in June, Kim and Trump agreed that Pyongyang would make efforts toward denuclearisation in exchange for the United States freezing its joint military drills with South Korea as well as potential sanctions relief. The nuclear talks, however, have stalled, with Pyongyang demanding sanctions relief and Washington wanting North Korea to take more concrete steps towards denuclearisation.